When I heard that Ihawan2, a restaurant offering Filipino fare as well as Japanese food, finally opened its doors, I convinced a couple of my coworkers to join me on the walk down to the restaurant so we could try out their Lunch Special: your choice of meat, plus the soup of the day and your choice of two sides for $8.50! We ordered our food and brought it back to the office, where we immediately devoured it and had to struggle to fight off the major food coma induced by the grilled meat. Good times. A few weeks later, Adrienne (one of our summer interns) and I met up with Elizabeth and Meg (friends of mine from graduate school) at the restaurant to eat in for lunch. Per usual, Adrienne and I each ordered the Lumpiang Shanghai as one of our sides - crispy and meaty and, really, the perfect plate of nibblers. Because Ihawan2 is so generous with their appetizer portions, we had more than enough spring rolls to share with Elizabeth and Meg. Our soup, a chicken and corn soup, came out in large soup bowls that looked like extra-large coffee mugs. The soup was creamy and very flavorful, but I was skeptical about the actual meat that was used in its making. I wasn't convinced that it was chicken and avoided all things that looked like chunks of meat. Eating the soup, you could just tell that the corn came from a can - it had that aluminum can taste to it - and I think the flavor could have been so much deeper if the soup were made with fresh summer corn. I strayed away from my previous choices of Pork BBQ and Chicken BBQ and ordered the Grilled Pork Belly with Garlic Rice for lunch. It sounded so intriguing when I considered the options on the menu, so I thought I'd be daring. Now, I'm no expert on how pork belly should be cooked or grilled (yes, yes, I know, I'm Filipino and have no clue how to cook Filipino food), but it was a little too chewy for me to be comfortable with what I was eating. I ate as much as I could before I allowed my brain to truly process what I was putting into my mouth and secretly wished that I ordered what Adrienne and Elizabeth ordered. They ordered the Pork BBQ with Garlic Rice. Who can resist meat that's been grilled on a stick? 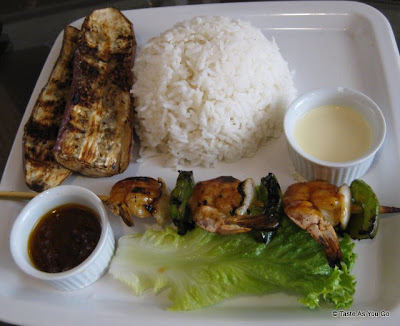 Meg ordered the Shrimp BBQ with White Rice and Grilled Eggplant. I mentioned earlier that Ihawan2 is generous with their appetizer portions. I think they could have thrown one more shrimp on the skewer to make the lunch a little more substantial. Because when you compare the Pork BBQ with the Shrimp BBQ, there's just no question that you're getting the better deal with the pork. Ihawan2 is off to a solid start. Their food is delicious and draws in a lot of Filipino customers (that's a good sign). But, with any new restaurant, there's room for improvement, especially in terms of the level of service. Our servers were very friendly and smiled when taking our orders, but after that, they were slow to respond and even slower to bring us our check. But I'm not giving up on them just yet. I have no doubt that the servers will develop a more efficient routine over the coming weeks and months and that Ihawan2 will be one of the busier Asian fusion restaurants in the neighborhood.